This was created because I am always looking for great blogger conferences nearby and yet often seem to miss them – even when they are in my own backyard. So, my team and I created this beast: The Ultimate Guide to 2018’s Blogging Conferences! Attending conferences and meeting other bloggers has been one of the most beneficial things I have done to grow my blog, so I would highly recommend finding one or two and going! No matter where you are from, there is sure to be a conference you can find that you will want to attend. Use the map to find the closest conference to you. If you prefer to search for a conference by date, we have created a calendar to include the dates of the conferences. And if you would rather have an a go-to list of these conferences in alphabetic order, we have that covered for you down below as well! Below, you’ll find detailed descriptions of each conference. When available, we included a video from the conference websites to introduce you and to help you choose which conference(s) you will be attending in 2018. This list will continued to be tweaked as as more up to date information is released from the conferences. Get your paper and pencil out, we know you’ll find at least a few blogging conferences you’ll want to attend! Equipping you with the tools and confidence needed to succeed in your blogging as well as homeschooling journeys. We also want to connect you with brands and opportunities relevant to your lifestyle. We strive to encourage and educate by teaching social media skills, networking techniques, and the art of blog crafting. We also stress the importance of maintaining a balance by keeping Christ first in our homes. We are dedicated to ensuring every attendee comes away from 2:1 with new tools, resources, and skills, as well as a renewed spirit. More than 5,500 digital marketers from over 70 countries will gather at the New York Marriott Marquis for the performance marketing industry’s premier global event. These high-level decision makers will come looking for online publishers, bloggers, traffic sources, retailers, networks, technology firms, digital agencies and other solution providers. And if you’re an Affiliate Summit attendee, it could be you that they find. There is no substitute for being here, demonstrating your solutions and building face-to-face relationships. The top companies and key decision makers in the space come to Affiliate Summit. Show them what you’ve got and what they’re missing. The conference and trade show offers attendees: three trade show areas packed with affiliates, merchants, vendors, networks, technology providers, digital agencies, traffic sources; multiple tracks of relevant educational sessions delivered by industry experts; a variety of networking events; and online tools to help you connect with other attendees before, during and after the event. Alt Summit is THE premiere conference for creative entrepreneurs and stylish social media influencers. At our conferences, you’ll find classes and information for a broad range of skill levels. If you’ve already designed a successful line of products, if you opened your first Instagram account last month, if you’re a social media pro, or if you’re just thinking about starting a future blog, then Alt Summit is for you. Established in 2009, the BarkWorld Conference & Expo is the only pet social media conference covering social media, lifestyle and technology as it relates to pet owners and businesses. BarkWorld is an extremely important aspect to mobilizing the new media needs and efforts of the community, and to address the increasing challenges faced by the pet industry. BASH is the premier networking event for entrepreneurs in the lifestyle/entertaining and party blogging community. Networking at it’s finest! Learn new ways to do new things, learn best practices, make new best friends. There is nothing that is more valuable than the time you spend face to face with other bloggers and event professionals, those who love doing what you do! Bash is full of amazing speakers and includes expert educational sessions on Event Planning Business & Professional Development or Entrepreneurship & Blogging. BConnected provides an opportunity for influencers, bloggers and businesses to connect with each other, while brands will meet influential bloggers all under one roof. Our goal is to provide hands on and useful information to further the influencers’ and brands social media goals and longevity, to help engage their audience and gives influencers and brands an opportunity to network, make new friends and nourish relationships. BookExpo America (BEA) is the #1 book and author event that offers the book industry access to new titles, authors, and education about the publishing industry. BEA is the best place to discover new titles and upcoming books and meet face to face with favorite and up and coming authors. It is a dynamic environment for networking, sourcing, and relationship building in the publishing industry in North America. Beer bloggers, industry bloggers, and other beer and social media professionals gather twice each year to meet, discuss, and share. One conference is in North America and a second in Europe. There are dozens of excellent potential topics involving blogging and social media. Keep in mind 2016 will be the seventh annual Beer Bloggers & Writers Conference so we have covered many topics. Topics that will be most successful are those at an advanced level or covering new ground. What began with food bloggers and enthusiastic foodies has grown into a blog conference where every blogger will feel welcome and learn constructive ways to grow their blog. Anyone that blogs will surely benefit from this two day event. Whether you blog for fun or trying to create your own unique brand, you will find something new to learn! Whether you are a blogger interested in connecting to a welcoming sisterhood or a brand looking to engage with a robust network of social media influencers, the Blogalicious community is rich with meaningful relationships and limitless opportunity. Social Media Master Class Workshop for Small Businesses. Do you need to master social media? Do you want to get your business on Facebook, Instagram, Twitter, Pinterest or more, but you can’t get any traction or don’t know where to start? We are here to help. We specialize in helping small businesses be awesome online and we’ll help you create a roadmap to success on social media. Parent bloggers and vloggers have become some of the most influential voices when it comes to promoting new brands and products. Over the past five to seven years, we’ve seen influential leaders emerge in the digital space, garnering thousands of followers and subscribers. These men and women have created complete online communities, and have the basics down. Blogger Bash will provide them with the next tier of their professional development. With events, parties, round table forums, speed dating sessions with brand representatives, and, of course, lots of swag to enjoy and review, Blogger Bash will give digital influencers everything they need to establish new connections with leading manufacturers. A multicultural festival of bloggers, journalists and social media mavens hosted by Black Bloggers Connect. Features four days of festivities across the country including:workshops, panels, and networking events and two days of the official Blogger Week UnConference and Digital Media in Social Justice Symposium. Blogging Concentrated “Pull Events.” This company exists because we need it to, you and I. We need learning entertainment that motivates, excites, encourages …but also has a return on investment. Solid ideas you can implement in your life to make it better. With our limited time we need to be surrounded by people who can move us forward in a way that makes tomorrow easier. And we wanted to create events that produce a return for the audience, not just good memories. We spend everyday working talking with business owners about improving their income and business models. Each and every one of those experiences gives us new insight into best practices. Since its launch in 2008 Blogging While Brown has grown to become the premier blogging conference dedicated to education, collaboration, and innovation among bloggers of color. The conference brings Black social media experts, speakers, and independent content creators together to educate, inspire, and expand their influence in new media. As an extension of the Bloggy Moms network, Bloggy Conference is designed with community and information as its cornerstone. Our goal is to provide real and useful information to further your social media longevity, to help you build strong connections, to provide support and resources in your areas of interest. Only by increasing your knowledge of the social media and blogging world, can you then begin to find success. Thanks to Bloggy Boot Camp, an extension of The SITS Girls community, women bloggers now have a way to connect with members of our online community and also grow these relationships in person. Living up to our fundamental belief that The Secret To Success is Support, our conferences give you the opportunity to increase your understanding of blogging and social media, while sitting next to your favorite people from your online world. What’s more, Bloggy Boot Camps are hosted in a variety of major U.S. cities annually, boast one of the lowest ticket prices around, and cover everything from photo-editing to social networking to branding. BlogHer is the largest community of women who blog: reaching an audience of 100 million across premium blogs, Web sites, Pinterest, Facebook and Twitter. BlogHer is a community and media company created in partnership with women in social media. Engaged, influential and info-savvy, these women come to BlogHer to seek and share advice, opinions and recommendations. The goal of BlogJam is to provide an opportunity for bloggers from Atlantic Canada to engage with one another face-to-face and to share experiences and expertise related to blogging through meaningful dialogue. Participants of BlogJam will be active in this experience through knowledge exchange, which will be facilitated by a day-long event, including plenary and workshop-style breakout sessions. Active participants of BlogJam will leave feeling enlightened and empowered to implement BlogJam-inspired ideas into their blogging experiences and related undertakings. The wonderful thing about blogging is that it’s a community– no matter your niche, you can learn the same strategies to success. We may work at home behind our computers, but the real success comes as we connect with each other to learn, grow, and build lasting relationships. Our focus is centered on building those lasting relationships while giving attendees tangible take-aways that will help them grow their social influencer business. A growing community focused on all things pet. Established in the summer of 2009, before anyone ever thought of bringing pet people together via social media, BlogPaws grew from a start of around 200 pet parents and brands, to the nearly 3,000 members in our community today. We continue to support all things pet, via our blogger outreach programs, our BlogPawsChats and BlogPawties on Twitter, and our national social media conference. Connection. Conversation. Collaboration. Those three words are at the heart of everything we do. BlogPodium is a conference designed to connect people together, encourage collaboration and sharing, while having a great time. We are Canada’s Conference for Design and Lifestyle Bloggers. The Blog University (BlogU) Conference ™ is a networking and educational opportunity for bloggers and authors who are looking to improve their writing skills, expand their social media reach, learn how to get published, or just connect with other bloggers. There is a high concentration of speakers from the mom, humor, and lifestyle niches. We set out to create the best conference for blogs to actually learn and get inspired. After years of going to conferences where the networking was great but the actual content was lacking, we decided to start our own conference where the speakers, classes and even the interaction with brands was all solely devoted to building your blog. The Mission of Chopped Conference is to bring together different communities of people with a passion for food around the core ideas of love, family, and community, and finding ways to share that via blogging to a larger audience. Our goal is always the same—produce inclusive events, create a positive atmosphere, keep learning and growth a primary focus, and have A LOT of fun. The Confluence Conference is a two-day digital marketing conference that features digital content creators, experts and leaders in digital marketing, branding, public relations, advertising, social media, SEO, and more. They consider themselves the COMPLETE digital marketing conference. Our goal is to foster the digital marketing community locally, regionally and nationally. We want to provide actionable digital marketing takeaways in an accessible, fun, and casual environment. ConnectHER Media is know for its unique and unconventional approach when it comes to event production and return on investment for guests in attendance. We always aim to bridge the gap between influencers, brands, bloggers, moms,PR, marketing and entrepreneurs and focus on direct interaction and provide plenty of opportunities for business growth. We are focused on creating an interactive environment and providing our guests with a unique experience. Craftcation is an annual four day business + makers conference featuring industry professionals leading attendees in hands-on food & craft workshops and lectures and panels on creative business. Craftcation ignites the entrepreneurial spirit, strengthens craft and business skills and builds relationships in the creative community. Declare is a Christian conference to equip and encourage women bloggers, writers, artists, online marketers, leaders, and disciples to know God and make Him known through deep community. Our Mission: To bring together women who share a desire to use their God-given giftings to point to Jesus. To bring in speakers and leaders to equip attendees with the latest in blogging, social media marketing, and technical teachings. And, to encourage attendees in their personal spiritual growth, drawing them nearer to God and motivating them to make Him known. The Design Bloggers Conference is the only conference specifically focused on the interests of interior design bloggers, interior design bloggers using content to build their business and personal brands, and any design professional seeking to learn more about using content on the social web. Attendees are interior design bloggers, luxury interior designers, traditional design media, new design media innovators, and interior design industry leaders. These events continue to be the premier conference and experience for professionals actively using or interested in learning about new media and the interior design industry. Digital Summit Atlanta fills your brain and professional toolkit with thought leadership and practical solutions designed to supercharge your customer strategies. Over 55 sessions on the best practices with actionable takeaways! Plus so much more! The Digital Media Summit, Canada’s premier social media and interactive marketing conference once again took place during Canadian Music Week. The one day digital conference located at the Sheraton Centre Toronto highlighted the worlds of social media and interactive marketing along with digital branding, examining successful engagement strategies for brands, business and media. Attendees had the opportunity to hear industry experts discuss key trends that are transforming and driving digital media. Digital Summit is where ideas and inspiration are born. Thousands of professionals work directly with industry leading brands learning practical, actionable solutions they can immediately apply back at the office. The conference will have 40+ sessions from subject matter experts at Microsoft to Facebook covering topics in strategy, mobile, video, social media, email, content marketing, UX design, and SEO. Digital Summit is not only a place for keeping up with the trends, but also for being an active player in their creation. The Digital CoLab conference will focus on advanced marketing strategies and customer acquisition for your content, e-books and courses, along with e-commerce, publishing, business administration and development and more. As the online marketing landscape changes and evolves, so does the content and expertise that we bring to our community and event each year. Our purpose is to connect brands and bloggers, companies with clients, ideas with executors, and consumers with content. Everything we do, everything we plan is to help YOU grow, improve, and most importantly feel empowered to reach your goals and change the world around you. We are honored to host such a high-quality, life changing event and would be honored to have you join us. FinCon is a peer conference for personal finance media. Attendees connect, learn to create compelling online content, and discover new trends in money. FinCon is an annual event with a dual mission. First, providing a “real world” connection for the people who enjoy new media and finance. Second, to provide a peer education in current consumer financial trends, as well as trends and tactics in new media. Focused Blogging Conference is a three-day, hands-on conference for bloggers ready to take their blog to the next level with qualified bloggers, as their mentors that work along side limited attendees in an environment that promotes community. As bloggers, parents, and advocates focused on food allergies, we are all connected – connected by our stories, connected by the illness, connected by the battles we fight, and connected in our interest to make the world a safer place for all with food allergies. You have told us that there is interest and desire for us to come together and share information, learn to be better advocates, and learn to be better bloggers! There is a great desire to hear from researchers and doctors, nurses, legal experts, advocates, and authors. The Food Wine Conference brings together bloggers, small business owners, winemakers, chefs, public relations professionals, traditional media, new media, authors and brands. FBC is Canada’s only national conference for food bloggers. It’s a fun and intimate event for bloggers, brands and speakers. Our Mission is to provide Canadian Food Bloggers with an opportunity to connect, learn and grow while showcasing their talents to the world. Join garden bloggers, new media innovators, and gardening and landscape industry leaders for the first annual Garden Bloggers Conference – the premier conference and experience for professionals actively using or interested in learning about new media and the gardening industry. This two-day conference brings you a unique opportunity to participate in the intersection of gardening with the world of new media including blogging, social media, and more. We invite all our fellow garden bloggers to attend! Designed to inform, educate and inspire, Go Blog Social is Kansas City’s first and only conference that brings together bloggers, social media experts and brands for unique networking events and conference experiences to connect-the-dots. Go Blog Social hosts multiple conferences and events throughout the Midwest. Haven is a DIY & decorating professional blogging conference. Our conference brings 400 pro-bloggers together with over 100 sponsor representatives for a 3 day event. Sessions focus on improving skills in blogging, decorating, home improvement, photography, writing, social media, brand relationships, book writing, and more! Our conference began in 2012 and each year attracts the most notable DIY/Home bloggers in the blogosphere. A conference for bloggers, influencers and small business owners on Social Media Marketing on live streaming app including Facebook Live, Periscope and Busker. Interactively live streaming the conference means that speakers will be answering questions during each LIVE session! This carefully designed retreat experience provides the training you want and the time you need to deeply explore the topics that will grow your online presence and allow you to reach more people with the message of Christ. In a unique setting inspired by the places Jesus walked in the 1st Century, you’ll have time and space to reconnect with your passion and leave with new skills and tools to meet the challenge. Whether you are stuck on increasing traffic, growing your email list, monetizing your blog or creating product, we’ll help you prioritize the key things that will get you unstuck then provide the instruction, time and help to get it done before you head home. Hispanicize is the largest annual event for Latino trendsetters and newsmakers including digital content creation, journalism, marketing, entertainment and tech entrepreneurship. The event is a launch pad for creative endeavors, new products, technologies, marketing campaigns, films, books and more targeting Latinos in the U.S. and/or Puerto Rico. Homegrown Blog Events are one-day events hosted in cities across the US. Combining hands-on educational workshops with a community of local bloggers, Home Grown Blog Events are the perfect setting for good ol’ fashioned fun! Bringing Health and Fitness Bloggers together for advanced blogging sessions, celebrity workouts, and exclusive access to the largest fitness event in the world. No fluff, no BS, no in-a-perfect-world theory. At the 6th Annual iMEDIA Social Media Conference in March 2018, you’ll enjoy interactive, practical learning experiences with industry pros and plenty of networking opportunities with your peers. We’re confident that you’ll walk away from the conference with new knowledge, feeling energized and ready to put your learning into practice in the real (not-so-perfect) world. Three days filled with fun, laughter, exploration, education and delicious food. You’ll walk away with a stronger sense of community, enhanced skills, confidence in your business and maybe even a few extra pounds. If you’re willing to come, we’d LOVE to have you. This is a fantastic opportunity to try great food and wine, learn from leaders in our industry and – as always – enjoy a fantastic weekend in the company of your fellow food bloggers. iRetreat… a once in a lifetime event focusing on you, the CEO of your brand, as we guide attendees along the ABC’s of blogging–Aspire, Build & Connect. As previous attendees can attest, iRetreat is a conference for influencers by influencers. Whether it’s your first or sixth time, we can’t wait to see you. Every brand has a story to tell! IZEA connects brands with influential content creators and publishers. Our platform enables content marketing and influencer marketing at-scale. The conference is a two-day event bringing together content Creators, Brands and Agencies. The Mom 2.0 Summit is the premier professional conference for influential mom bloggers and female entrepreneurs who create online content. Every year, women leaders in media and business converge at the Summit to compare notes, discuss ideas, and forecast what’s next for women online and in the marketplace. Our Mission is to meet smart people. Hear success stories. Discover new sites. See what’s working, and figure out what the heck all this social media buzz is about, what it can do, and why you should care. The Moms Meet WOW Summit is an annual event for Mom Bloggers & Influencers, and Moms in general, focusing on living a healthier lifestyle. The first day of the event (Friday) is a full day of blogging workshops, panel discussions, blogger-only exhibit hall time, and brand/blogger networking finishing off with a cocktail party. Day 2 is all for moms and we have inspirational speakers, interactive workshops and more exhibit time – and to top it all off, every attendee will walk away with a huge goody bag filled with over $150 worth of better-for-you products. NEPA BlogCon is an annual, day-long conference that’s so much more than your average “Hey, let’s talk about blogging,” event. If you’re looking to learn the REAL scoop behind what makes the blogosphere the place to be nowadays, then this is the event for you. NEPA BlogCon is for everyone. Seriously. We welcome everyone to come learn about blogging and storytelling through the Interwebz. So, if you’re an Internet and IT pro who wants to network with other techy types, register! We’d love to meet you. Consider yourself to be a wordsmith with a passion for the publish button? Yep, we’re all about that too. Come join us! This is the perfect place to meet people who share your passions. Pinners is two great events in one. It’s a conference featuring 100 Pinterest-based classes taught by the best presenters in the nation. And it’s also an expo with nearly 200 top businesses providing beautiful options in the worlds of DIY, crafts, cooking, self-improvment, photography, party planning, scrapbooking, holiday, beauty and fashion and all sorts of other great things. What’s Pinners? It’s where Pinterest comes to life. And it’s your new favorite event! Join some of the world’s leading thinkers in online marketing for two days of ideas and inspiration. This conference will discuss the latest in search, analytics, content creation, optimising your website, paid promotions and more. To the 1st International Blogger Community & Conference for Black Female Bloggers, aspiring to bring Confidence, Character & Competency within our Community. We serve and unite black female bloggers, creatives, and entrepreneurs who want to start blogging because we believe that by bringing us all together we can accomplish so much more. We host our annual bloggers conference in Canada, USA, and Sweden to unite the community internationally, to encourage and to learn from one another so that we can all reach our highest potential while pursuing our dreams. ShiftCon supports an Expo with over 50 brands that mirror our ideals. ShiftCon attendees value transparency, health and eco-friendly values. We not only expect that from the companies and brands we support, we applaud it, celebrate it and promote it. SIMPLY NYC will be back in New York for an unforgettable conference experience, on Saturday, February 10th, timed to kick off NYFW, perfect for fashion and beauty lovers. This will allow fellow fashionistas a chance to access the glitz, glamour and industry experience of New York Fashion Week through SIMPLY’s accessible fashion program with top industry innovators and keynote speakers. The SIMPLY NYC conference will have inspirational and educational panels presented by influencers who are shining bright in the worlds of fashion, beauty, blogging, and tech. Speakers to include Pitch Perfect actress and activist (Love is Louder) Brittany Snow, Youtube star Bethany Mota, Wendy Nguyen of Wendy’s Lookbook, Claudia Oshry of Girl With No Job, Beca Alexander of influencer marketing and casting agency Socialyte, and many more! Enjoy the SIMPLY experience that will include a full day of panels, breakout sessions, cocktails, pampering, meet & greets, hundreds of Instagrammable moments, networking opportunities, sweet & savory bites and incredible gift bags to boot. The Simply Stylist fashion and beauty conference is designed to connect career-minded fashionistas, beauty lovers and geek-chic techies together in a space where they can network and learn from experts in their field. We are passionate about educating fashion and style enthusiasts by connecting them to style experts who can share industry insight, provide one-of-a-kind advice and even address personal style dilemmas. In recent years, top stylists have justifiably become celebrities in their own right. Looks they’ve created for clients have shaped trends in magazines, blogs, and entertainment and have even influenced the way consumers shop. SITSum, the Social Influencers Travel Summit, is an exclusive, invitation-only event bringing together individuals with a strong social media or blog presence for a weekend of workshops and adventure. Top national influencers on Facebook, Twitter, Pinterest, Instagram and more will join forces to learn from the best – one another! We inspire one another and when we connect in ways that comfort and sustain, it is something truly extraordinary. That is why we launched Snap – a community where imaginative bloggers can come together; learn from one another and walk away invigorated. We’re joined by the best bloggers representing modern handmade, contemporary craft, mind-blowing home-based events and DIY, along with dozens of creative entrepreneurs. Don’t you wish there was a conference that combined high-quality sessions with an amazing social experience? Well guess what? You found it! 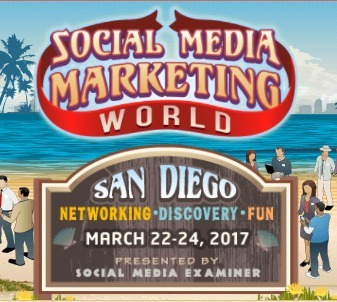 (at) Social Media Marketing World® …you’ll join 4,000 fellow marketers at this mega-event designed to inspire and empower you with social media marketing ideas. Social Media Mastery is the all-in-one conference bringing together marketing professionals and small business owners to learn and prosper through social media. Learn from experts at our value packed sessions as they reveal their fundamentals and formulas that contribute to a successful social media strategy for businesses big and small. The SoFabU on the Road conference series is an extension of Social Fabric University (SoFabU). SoFabU provides online education opportunities to members of Social Fabric, Collective Bias’ proprietary community of influencers. In order to help influencers grow even more, we wanted to provide members with a conference experience that was accessible and meaningful with a sole focus on education. Update: There is no conference being planned for 2018 at this time. The Southern Coterie is a resource for the entrepreneurial. Southernc.com is a virtual front porch for Southern creatives and entrepreneurs. Designed to offer a community of passionate business owners, makers and doers the opportunity to connect, collaborate and create, the “Southern C” is capturing the South’s entrepreneurial renaissance one post at a time. From “get to know” Q&A’s to inspirational start-up stories, to tips from the top names in the media, blogging, and business community, the “Southern C” is the virtual version of a traditional front porch – a laid-back gathering place to share, inspire, encourage and nurture creative minds. The Southern C Summit, The Southern Coterie’s live event, brings the online content to life offering attendees an opportunity to network and connect in person. The niche multi-day conferences combine educational and inspirational sessions with the best and brightest names in Southern business and branding intermingled with phenomenal food, drink and inspiring locales all while fostering a strong sense of community. The Toy Insider’s Sweet Suite event where top digital influencers and members of the press from the U.S. and Canada will gather or the biggest night of play, meeting face-to-face with the biggest companies in the toy industry to be the first to play with some of the hottest toys! Tastemaker Conference is a place where food bloggers don’t just meet, they make. You will make contact with incredible vendors and foodies. You will make career goals attaining invaluable information on the business aspects of the industry. Most importantly, you will make lifelong connections in a community of creatives who want to influence the world with their gift for food. This conference is for food bloggers, foodie influencers, and content creators—for all levels, from beginner to professional! BakeSpace.com’s TECHmunch is the traveling conference that helps food and lifestyle bloggers learn the skills they need to succeed and take their blogs to the next level. TECHmunch is held in multiple cities each year. We started this conference because we believe bloggers shouldn’t have to pay a lot of money or travel far to attend a world class conference. This mission statement still holds true to this day. Each city event is coproduced by a local blogger who helps define and shape that city’s programming and speaker lineup — aligning perfectly with the community’s need for stellar content. We believe that events within the Influence Network are for every woman. We believe that every woman has God-given influence right where she is–whether she’s a student, married, entrepreneur, creative, speaker, writer, executive, teacher–it doesn’t matter. Our conferences are a celebration of this truth and the chance for like-minded women to come together to worship, connect and learn together. In the past, we’ve hosted speakers Lara Casey, Shauna Niequist, Annie Downs, Jeff Goins, and others. By attending Thrive 2018 you’ll get access to an empowering weekend. You will be surrounded by like minded creativepreneurs and learn from an amazing lineup of speakers that are there to teach you how to take your business to the next level. A full lineup of speakers and sessions will be announced in the next few months. Not only will you learn, you’ll be inspired by all Thrive has to offer, including opportunities to connect with brands one on one, countless photo opportunities, food, pop-up shops, swag bags and lots more. Type-A Parent is world’s top conference for mom and dad bloggers, and the first social network for parent bloggers (established in 2007). The site is both network and online magazine. Hundreds of bloggers have contributed and thousands are members, and “Type-A” has become synonymous with power blogger and social media influencer. Type-A Parent Conference has a well-established reputation for outstanding learning with actionable takeaways. It features power networking with the best and brightest parents who blog plus the major brands and firms who want to engage them. Type-A is where the power parents grow their business and connect. Welcome to our Sisterhood of inspiring Latinas. A network of digital influencers, hyperlocal events and annual Summit that boldly propels growth through brand partnerships and community development. Our Mission: When one grows, we all grow. #WeAllGrow Latina Network (formerly Latina Bloggers Connect) started with a simple idea: community. Together, we support bloggers and brands in building authentic collaborations that deliver measurable results. Premier event for women travel influencers and industry members. Our goal is to provide our attendees with the tools, connections, and resources they need to become better travel bloggers and influencers and to equip great brands with partnerships that can help them enhance their digital presence and meet their business goals, all while growing our global sisterhood of dedicated women who travel. Is there another conference for bloggers we missed? Be sure to let us know in the comments!! My name is Daphne, and I am reaching out on behalf of an amazing food blogger conference called Tastemaker Conference. We’d love to have Tastemaker Conference 2018 included on your list of 2018 blogger conferences. It will be held at The Falls Event Center in Salt Lake City, UT on September 14-15, 2018. This conference is for food bloggers, foodie influencers, and content creators—for all levels, from beginner to professional! We believe that Tastemaker Conference will help food bloggers reach their fullest potential and wildest dreams, and would love to have it included in your 2018 conference list in order to ensure that as many food bloggers as possible are aware of this incredible opportunity. Let me know if you have any questions or need further information! Looking forward to chatting. Thanks, Daphne – we will look into adding you to our spreadsheet! What an awesome list! We’d love to have FLOCK Presents events added to your list. We host one day intensive events around the country on a variety of topics. You can learn more at flockpresents.com/events.